Last week, Bismarck, ND was host to the second annual Great Plains Energy Expo and Showcase. Hosted by Bismarck State College and Senator Byron Dorgan, the conference focused on North Dakota's growing energy industry, including the wind energy sector, with presenters such as T. Boone Pickens discussing the opportunities and challenges facing the industry. Wind is a readily available resource on the plains of North Dakota, which have been referred to as the "Saudi Arabia of wind". According to David Hadley of the Midwest ISO, a transmission coordination agency, North Dakota is the top state in the nation for wind energy potential. At 40% capacity, the state would have over 345,000 MW of potential generation capacity. Current generating capacity is a minuscule fraction of this potential output. However, North Dakota has seen a major increase in investment in wind energy projects over the past several years. In 2005, there was only 80 MW of wind generation in the state. As of June, 2008, that number stands at "716 MW either in service or under construction, plus another 807.5 MW that has either been site permitted or is in some stage of the siting process." According to the Midwest ISO, potential North Dakota projects being discussed or currently under way add up to 7656 MW of potential generation. One major project under discussion would include 2000 MW of generation, costing around 4 billion dollars. The development is, in the words of one elected official interviewed by the Bismarck Tribune, "truly eye-popping." Standing in the way of exploiting the Great Plains' wind bonanza is a major challenge- transmission capacity. North Dakota currently has a transmission export limit of 1950 MW, which is fully subscribed by current power producers. While several upgrades to the system are in the works, they will fall far short of the massive build up in transmission infrastructure needed to allow for continued rapid expansion of generation capacity. As one presenter at the Great Plains Expo put it, the region is "a victim of [its] own location." In August the New York Times discussed the challenge posed by transmission limitations, noting that "North Dakota and South Dakota, could in principle generate half the nation’s electricity from turbines. But the way the national grid is configured, half the country would have to move to the Dakotas in order to use the power." If unaddressed, the inadequacy of the electric grid will serve as a check on energy driven economic development on the Great Plains. Rick Sergel, President of the North American Electricity Reliability Corp. (NERC), argues that "Without new transmission development needed to support these resources," it is likely "only a fraction," of currently proposed wind projects will be built. Speaking to Reuters, Sergel called for serious consideration of "comprehensive plans that cross state lines and international borders to build the clean-energy superhighway that will provide everyone equally with access to carbon-free generation". It appears that expansion and modernization of transmission infrastructure will receive significant attention from the incoming administration. President-elect Obama stated in an interview on MSNBC that "the most important infrastructure projects that we need is a whole new electricity grid," and that he wants such projects "to be able to get wind power from North Dakota to population centers, like Chicago." With the current economic slowdown increasing calls for an economic stimulus package, investment in infrastructure, including grid expansion and modernization, appears set to take a central role in policy discussions in the coming year. For our War of the Regions piece I went through BLS data and calculated location quotients for a few key diverging industries, namely manufacturing and securities, commodities and investments side of the finance industry. These are the kind of numbers that really benefit from geographic visualization. A LQ tells us not where the most jobs are in any given industry, but how much of a state's employment is clustered in the given industry. I've been following FortiusOne for a while but this is the first time I've gotten a chance to play around with their GEOCommons Finder! and Maker!, a new social production platform for agglomerating, sharing and visualizing geographic data. It's a fantastic platform. Click on the map images here to explore them on the GEOCommons platform. 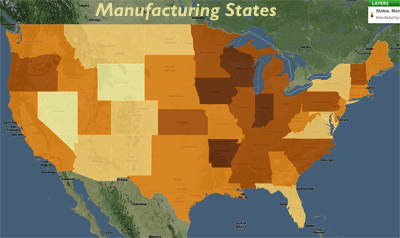 You can see a lot of dark color in the rust belt, but at this point, the states of Indiana, Wisconsin, Arkansas, Iowa, Alabama, and Mississippi are at or ahead of Michigan and Ohio in state dependence on Manufacturing. Part of this is due to growth in the South and Great Plains, and part is due to manufacturing job losses in the Rust Belt, causing the concentration there to slip. Finance here is limited to Securities, Commodity Contracts, and Other Financial Investments and Related Activities (NAICS 523). Not surprisingly, this industry is clustered in the Northeast. You see Illinois, Minnesota, and Colorado shaded darker due to the role of Chicago, Minneapolis, and Denver as regional trade centers. Take some time to explore GEOCommons and some of the other visualizations created by others, and watch for more maps in this space as we do the same. While the decline in housing prices in America has been making news for some time now, less attention has been paid on this side of the Atlantic to the downturn in European housing. The housing market in Europe, much like that of the United States, "soared during the first half of this decade, rising far beyond the levels that you'd expect, based on traditional economic factors." The fallout from the bubble is beginning to look the same, if not worse. According to Newsweek, over the first six months of 2008, housing prices in several European nations, including the United Kingdom, Spain, Sweden, and Norway, have fallen "at a faster rate than is occurring in the United States." According to one analyst interviewed by Newsweek, the European downturn is still in an "early stage". Eastern Europe is also seeing major fallout from deflation of the real estate bubble. According to Reuters, nations such as Bulgaria, Romania, and the Baltic republics of Latvia, Estonia, and Lithuania, have seen property prices plummet as easy access to credit has dried up. A Bulgarian property agent interviewed by Reuters reported that "No-one is buying. Everything has frozen". The credit crunch has led to fears of "a wave of bank and currency crises," which might necessitate IMF bailouts of several Eastern European nations. In the past two weeks Hungary and Ukraine have been bailed out, with the IMF providing loans "totaling $32 billion, in exchange for belt-tightening." A recent report on European housing by Stratfor argues that the housing bubble faced by Europe was larger than that seen in the United States, and in correcting could lead to a "long-term deflationary spiral". The report points out that in addition to facing overheated housing markets, Europe, over the long-term, faces a "poor demographic situation," with a birth rate well below replacement level. According to Stratfor, this situation "will dampen the demand for housing in the long term and possibly create a deflationary spiral in the housing market". Not all analysts are so gloomy, with some arguing that "the practice of giving mortgages to less credit-worthy buyers," never reached the same levels in Europe, and that while prices did boom, there is not a "vast glut of never-lived-in houses sitting vacant on the market," which should help to mitigate the situation. Regardless of the severity, it appears clear that Europe is set to face a continued period of real estate value contraction. 2007 was a good year for rural America. Driven by "bumper crops, strong demand, and high prices" in commodity markets, farmers across the United States enjoyed an "exceptional year". Strong conditions continued into the first half of 2008, spurring farmers to increase "purchases of capital equipment and household consumption," and fueling "double-digit percentage gains in cropland values," in many areas of the nation. "I guess you could say there's an awful lot of concern in the rural communities and with some of the city people... I would think there would be a lot of cautiousness among farmers because most of the people can remember the '80s and I would think there's probably a lot of cautious people now on spending a lot of money." While rural communities may be facing tougher economic times in the face of a bursting commodity bubble, it appears that their banks will be able to meet such challenges from a position of relative strength. According to Reuters, banks throughout rural America "are not freezing credit to customers like large money center banks, offering a bright spot in an otherwise gloomy economy". Such banks have "largely steered clear of the subprime housing loans," have "low to no exposure," to credit derivative instruments, and are able to draw on a strong base of deposits to continue to provide loans. Those loans will also be made at far better terms than those seen during the farm crisis, with banks today offering farmers "interest rates that are one-third or one-half of what they were in the late 1970s." While conditions may have some ways to go to match the bleak days of the farm crisis, some legislators are already expressing concern about access to credit in farm country. This week, Sen. John Thune of South Dakota called for a hearing to explore the impact of the credit crisis on rural America. While rural banks may be in relatively sound health, it appears that those same banks are, according to the AP, requiring "more collateral and higher interest rates," for loans, and are, in the words of a Texas A&M economist, "turning conservative". However, the AP also notes that even in the face of such tightening, lending will continue, as "the industry's traditional lenders — independent commercial banks — are on more solid financial footing than the country's largest investment banks and commercial banks". Talk of bailing out US automakers has dominated the news recently, and we all know that means Michigan. Michigan is home to roughly a quarter of the country's auto manufacturing jobs, and the industry is in rapid decline there and in Ohio, but the state of automaking employment in the rest of the country may surprise you. 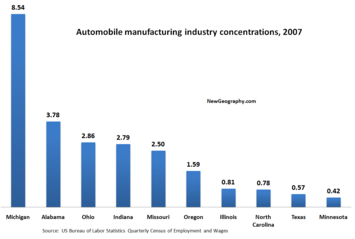 The economies of Michigan, Alabama, Ohio, Indiana, and Missouri are the most highly dependent on auto manufacturing. While Michigan and Ohio have lost more than 43,000 auto jobs since 2001, Indiana actually added almost 3000 over the same time period and Alabama more than doubled its auto industry, adding 8600 jobs. In fact, the rest of the nation aside from Ohio held about the same number of automobile manufacturing jobs in 2001 as the state of Michigan. While Michigan has shed more than 35% of its employment in the industry, the rest of the country actually held its own over the same period. One major caveat - this source of BLS data is only current through the end of 2007, so it doesn't quantify the effects of the recent credit market implosion. 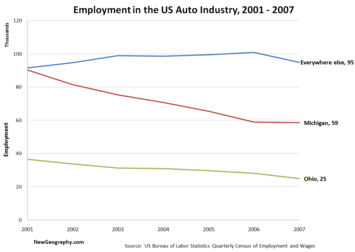 What it does show is a strong decentralizing trend in the auto manufacturing industry. Looking at average annual pay, the small vehicle sector in Minnesota leads the way - jobs there average over $100,000. At well over $90k per job in Michigan, you can see what the rapid decline in automaking has contributed to the evisceration of the state economy. 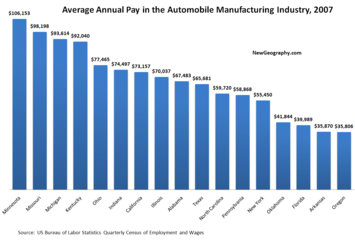 In the top four highest paying states - where workers make more than $90,000 on average per year - automakers have cut more than one third of the jobs in those states since 2001. So while the failures of major automakers would send ripples throughout the North American industrial economy, what we are really contemplating here is doling out support for the declining states of Michigan and Ohio. Working on a construction crew back in college with a few workers each from Mexico and Guatemala, I was amazed at the animosity between the two groups. They would joke, not good-naturedly, about how much cheaper the prostitutes were in the neighboring country or how stupid the other's politicians were. I traveled in Central America a few years later and found the same thing. This great article from earlier in this week's LA Times shows the economic and cultural effects of these nationalist tensions in the U.S. It chronicles how immigrants from El Salvador have to assimilate to the existing Mexican power structure in Los Angeles for jobs. Since the dominant Latin culture in LA is Mexican, and there is a strong nationalistic bias in some communities, El Salvadorians are changing their accents and even adopting their cuisine and mores to fit in. The reverse is true in other cities. When one of the Mexican construction workers I knew flew out to D.C., he entered a taqueria in the Adams-Morgan area. Upon hearing his accent, the cashier from another Central American country promptly said, "The Mexicans eat over there." Looks like you better choose your adopted city carefully if you're a Central American immigrant. North Dakota is not a state known for supporting Democratic candidates in Presidential elections. In the the past 80 years, it has only backed the Democrat three times- Franklin D. Roosevelt in 1932 and 1936, and Lyndon B. Johnson in 1964. This year, however, North Dakota may be in play. While President Bush won the state in 2004, 63% to 35% over John Kerry, the most recent polls of the state, by Research 2000 and the Fargo Forum, place the 2008 race in a dead heat. This may be a reflection of a wider trend in rural areas. A survey of rural voters in 13 battleground states released in late October by the Center for Rural Strategies, showed Sen. Obama and Sen. McCain tied among rural voters. In September, similar polling by the center had shown McCain with a 10 point lead among rural voters. According to Reuters, in 2004, President Bush "won rural districts nationwide by 19 points." If the recent 2008 polling proves accurate, Tuesday night may be an unhappy evening for McCain supporters, with Sen. Obama facing the possibility of winning by a healthy margin, potentially bringing rural states such as North Dakota along for the ride. A new study from Maplight.org, a "nonpartisan, nonprofit research group illuminating the connection between money and politics," reports that "U.S. House members raised $700 million in campaign funds," during the 2005-2007 time period, with 79%, or $551 million of that amount coming from outside the district of the House member running for office. About two-thirds of House members, 274 out of 421 (65%), raised half or more of their funds from out-of-state. Ninety-two House members (22%) raised 70% or more of their funds from out-of-state. 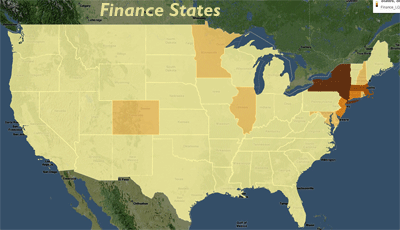 Eight House members raised 90% or more of their funds from out-of-state. The average percentage of funds each Representative raised from out-of-state is 56.7%, and the median percentage is 56.1%. It should be noted that the Maplight report only looks at donations of over $200, the point above which the donor must be identified to the Federal Elections Committee. Much has been made of the move, particularly by the Obama campaign, towards utilizing a base of small donations, under this $200 dollar threshold. Estimates place somewhere between one quarter and one half of Sen. Obama's $600 million of campaign contributions in this class. This potential move towards smaller donations does not appear to have had as much of an impact on Congressional races. According to the Campaign Finance Institute, registered candidates for the U.S. House raised $447 million in the first four months of 2008, with "less than 10% of this total [arriving] in amounts of $200 or less." This, states the CFI, marks little or no change from prior years. Back when the media was more obsessed with the state of global warming than the state of global lending, the environmental movement appeared completely ascendant. But with economic concerns in both Europe and North America on rise, their premier issue of global warming seems to be losing some of its political cache. A good account of what’s happening both in Canada and Europe can be found in the green blog, Breakthrough. There’s even some advanced thinking here about the need to make something like a “carbon tax” a spur to economic growth. On target for the most part, Greens seem to have a problem thinking about the economy. Like John McCain, it’s not their strong point. These shifts in popular concerns, as well as the real estate downturn, create an odd atmosphere for the kind of restrictive legislation discussed in Wendell Cox’s timely article. Still there remains a great temptation – justified or not by the facts – to use global warming as a means of imposing the perennial anti-suburban agenda of some planners, large urban developers, smart growth advocates and urbanists. Perhaps it is a good strategy for density advocates to push their case now when it all seems so theoretical and builders are still walking around in shock. It may take years to absorb vacant condo towers as well as newly foreclosed single family houses. Only when the economy turns around will the conflict over what actually is greenest – as well as most market friendly – intensify again. Politicians from both parties, while on the campaign trail, often argue that they will work to make a college education accessible and affordable to all Americans. Very rarely will one hear calls for "better quality" of education at our colleges and universities, with such debates seemingly being restricted to our K-12 educational system. An opinion piece in the Chronicle of Higher Education claims, however, that many of our institutes of higher learning are failing to meet the challenge of providing a good return on investment for those attending their institutions. In his piece, education consultant Marty Nemko argues that "college is a wise choice for far fewer people than are currently encouraged to consider it," and that colleges and universities need to be held accountable for their "defective products: students who drop out or graduate with far too little benefit for the time and money spent." "Among high-school students who graduated in the bottom 40 percent of their classes, and whose first institutions were four-year colleges, two-thirds had not earned diplomas eight and a half years later." Nemko also takes issue with the quality of education received by those who do graduate, stating that "50 percent of college seniors scored below "proficient" levels on a test," requiring them to perform basic tasks, and that "the percentage of college graduates deemed proficient in prose literacy has actually declined from 40 to 31 percent in the past decade." Many young people, Nemko argues, should look to other routes of career development and education, such as apprenticeships and other vocational training. "had 40 job openings posted for CNC technicians. They graduated seven people. In mechanical design, they had 85 job postings and graduated nine people. In electro-mechanical technology they had 75 job openings and graduated four people." "If we can’t get more [people] interested in two-year college educations and jobs that require a specialized skill like industrial maintenance mechanics or carpentry and electricians, we’re going be in a deep world of hurt in about five years when all these people retire and we can’t produce goods we need to produce." Communities around the nation will need to find ways to meet such shortages, and build their productive economies. Failure to do so may lead to a loss of potential economic growth. According to the technical instructor, in the face of shortages of skilled workers, "companies may back off on the expansion or growth. Or they may end up relocating to a place where they can find these employees." Convincing young people that there are other good career options outside the four year degree path will be among the many challenges faced in building our nation's economic future.